Today’s dress is a sort of “indie love child,” a combo of two different indie company patterns. 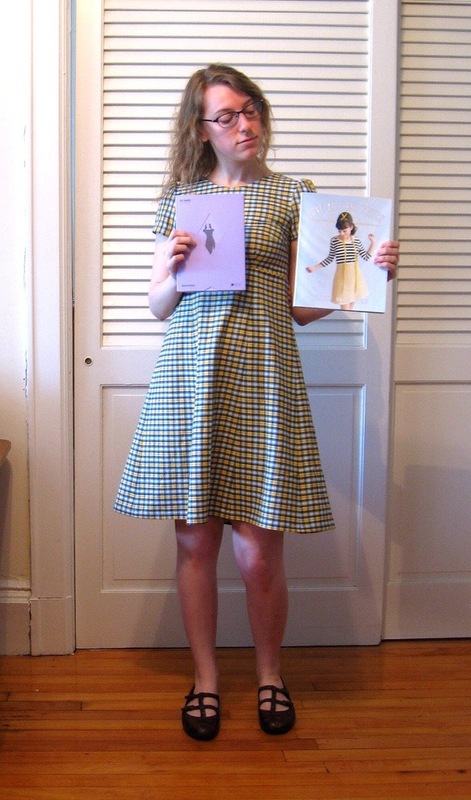 The bodice is from the Megan dress, one of the patterns in Love at First Stitch, Tilly’s fantastic new book. I knew I would love the patterns in that book, and let me tell you, this one did not disappoint! The fit it almost perfect – I didn’t make any alterations to this version. The only fit issue is that the bust darts are a tad too high – an easy fix for next time. The pattern is also pretty ingenious as a pedagogical tool. Since the bodice is very high waisted, you don’t have to worry about fitting the waist, just the bust. 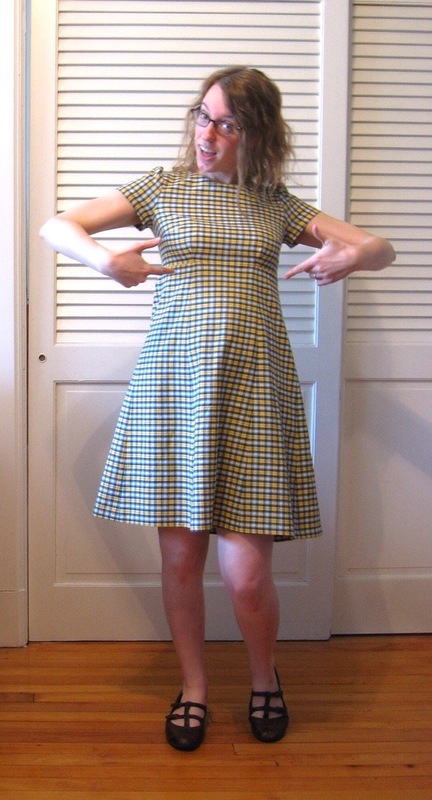 And using a tuck instead of a waist dart also makes the fit easier – the perfect first dress pattern! I can’t wait to make the rest of the patterns in this book! Oh, and in case you were wondering – the entire book is amazing, and even if you’re not a beginner, it’s worth it for the patterns alone! Now on to the skirt. I’ve been a bit frustrated with my flouncy, full skirts lately because it is so friggin windy in Boston these days, and I keep having close calls with wardrobe malfunctions. Argh! But when I wore one of my BHL Anna dresses the other day, I was reminded that their six-panel skirt isn’t so full that it gets caught up in the wind, but still full enough to create the silhouette I like. So I introduced Megan to Anna, and they were instantly friends! One pattern alteration note: I did have to add about a half inch at the center front panel on the fold in order to get the skirt seams and bodice tucks to match up, but that was an easy fix. All in all, I love this dress! It’s comfy, unique, and exactly my style. Aren’t new friendships beautiful? That looks great! I’m impressed with the fit and how you matched up the lines. Great job! Matched seams! I am in awe. What a great job! It fits you so well. Haha, thanks! I’m kind of addicted to stripe/patten matching now!